[New for 2018] So, are you surprised at how many companies have jumped on the (ultra) light ice cream bandwagon? I don't know if I am or not, but what did surprise me was when Arctic Zero decided to jump on this bandwagon with 7 new light ice creams. While most companies are reducing down to light ice cream, the people behind a frozen dessert actually went up the ice cream food chain. Let's see if it's going to work out for them. "creamy vanilla flavor with chocolate sandwich cookies"
My Stop & Shop also had chocolate chunk and then the other five flavors that you might find are peanut butter & chocolate cookies, mint & chocolate cookies, vanilla bean, cookie & brownie dough, and toffee crunch. After removing the plastic seal, I see a fairly normal looking like ice cream in front of me. Yes you can see tiny air bubbles here and then but it's nothing like the shock of the first time I opened a regular pint of arctic zero. This has an actual white base with cookie bits strewn about and some of the bits are a decent size. I take my first few bites and it's not bad. While I got a strong skim milk vibe from the C&C of a new Breyers 2n1 flavor, I don't get that here (which I greatly appreciate). I'm not saying it tastes like straight up ice cream, but I'm not shocked in any particular direction. I can tell it's different, but I'm not afraid. The cookie bits are actually pretty good, the big ones in particular of course. They are fairly soft but solid and deliver good flavor. 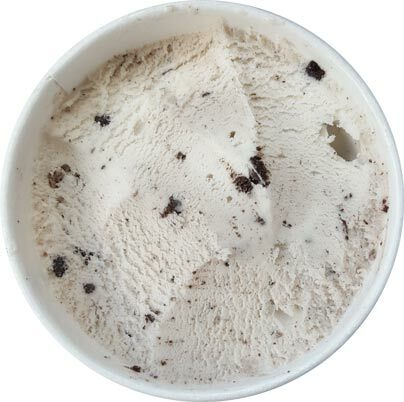 After I had gotten fairly in to the pint, I realized that some spots had more cookie factor than others. What I mean is that while many early bites had a little bit of cookie flavor to them, I started hitting bites that were straight white base with almost no cookie factor. 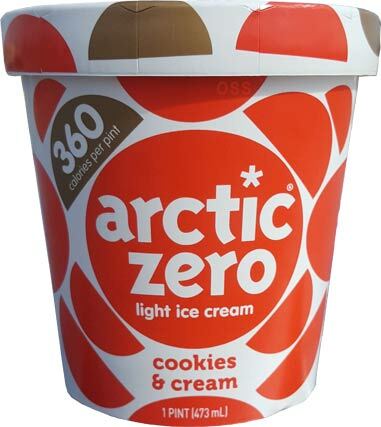 Arctic Zero seems to have a decent thing going here, and results will vary from pint to pint probably, but it would be nice to see the cookie vibe be a little stronger and consistant to help me focus on the cookie flavor rather than on how light the ice cream is. Wait, to clarify that last point, this stuff isn't crazy light, nor is it super gummy or just odd. It does seem to melt (look) a little funny on the edges, but I get that we are dealing with just a handful of calories per serving so there has to be differences here. Overall, AC makes a respectable first impression without relying on any sugar alcohols. You all know how I hate sugar replacements and their effects of many of us. My biggest parting thought right now is the fact that I have to shell out $5 a pint but only get 360 calories in return. That's a pretty low calorie to dollar ratio. 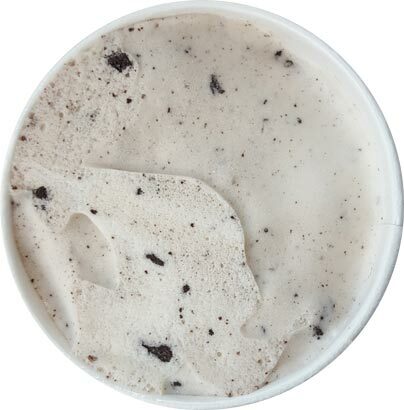 It looks like Arctic Zero changed their Cookies and Cream recipe. The original one was 30 calories per serving, didn't have any mix-ins, and required an acquired taste for the product. Also Arctic Zero was the first one to develop these low calorie ice creams years ago, and it's amazing how much the trend has grown with the bigger companies like Ben and Jerry's and Breyer's now taking part. it's not a change, this is their new lineup that will go along side their regular product. It is funny to see arctic zero, who was trying to attack the same crowd as halo top, now have to switch it up and make a separate product line. Dubba, I agree with you. It IS funny to see Arctic Zero having to switch it up and make a separate product line. Their original products for Arctic Zero weren't very flavorful. 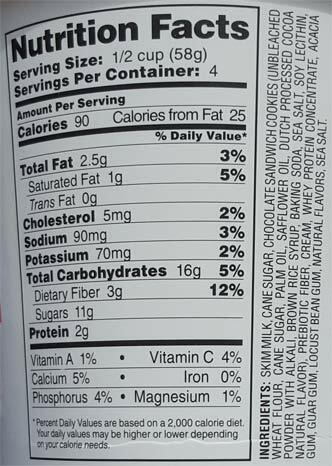 Hey now, their original line meets the needs for some of us calorie counters :) That said, it is interesting to see others follow suit on HT - so many store brands, now (though erythritol and I aren't exactly on friendly terms, either...bring me some sucralose and aspartame! ;)). Thanks for this review, I've been dying to know how they did with these! While I agree that their original pints leave A LOT to be desired, I must hand it to them and admit they were making some progress with the Chunky Pints. The cookie dough, for example, wasn't awful. The base wasn't good, it wasn't bad, it was just there, but at least they had A LOT of delicious cookie dough chunks to make up for this. The Peanut Butter Swirl chunky pint would probably be my favorite. It has that same icy feel (albeit more creamy, too), but a lot more flavor and kind of reminded me of the Polish Water Ice I get at the ocean! I really enjoyed it! Still, I feel like Arctic Zero started the lower calorie pint trend in the first place so I'm happy to see them not giving up and coming back at the competitors with these. I'm still waiting for a more unique flavor like Cotton Candy or Carrot Cake to come out, but no other brands have a Toffee flavor yet so I'll be sure to try this one first once I find these AZ pints! Funny how back in the day people were more concerned with getting more food for less money, whereas now we seem to be willing to pay more for less food. I'm very guilty of this and I consume way more pints of Halo Top/Arctic Zero/Enlightened/Breyer's Delights than I care to admit. Still, out of all the brands so far my favorite has been Enlightened (their Chocolate Peanut Butter is out of this world, and so is their Cold Brew), but I'm hoping AZ changes that! AZ has always been a really nice, down to earth company with great customer service.